Urban Wine Country-Newly renovated, 1500 sq ft, 2nd story, spacious flat in the lovely town of Sonoma. This home features a full kitchen with all amenities, two large bedrooms with king beds, 2 full bathrooms with large tiled showers, a giant living room with a 42' TV with cable, DVD player, CD/MP3/am-fm stereo, reading nook in the corner, views of the Sonoma hills. Dining table seats six. Laundry facilities include washer and gas dryer. Due to low windows and an inside stairway among other factors, MaryJeans is not recommended for young children. THERE IS A TWO NIGHT MINIMUM STAY REQUIREMENT! Thanks for looking😉! MaryJean and Terry have lived in Sonoma since 1975 after moving there from their native San Francisco. They've raised two children here, and are helping now and then with 4 grand children . They've run a successful family plumbing business in Sonoma for the last 20+ years and are slowly letting go and letting the next generation take over. After renting homes while on vacations themselves they decided to convert a rental they owned into a vacation home, mostly due to the location on Broadway. 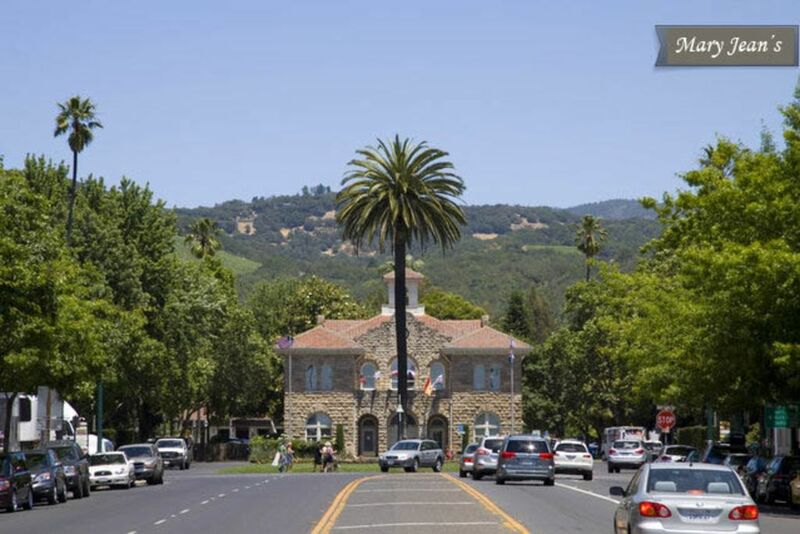 It's a short walk, bike ride or drive to the Sonoma Plaza, many of the excellent wineries, restaurants, shops and historical sites Sonoma Valley is known for. Bike shop next door rents bikes. Sonoma National golf course is 3 miles away. This is a 2nd story home with front and rear stair entrances/exits. Within walking / biking / driving distance to Sonoma Plaza, historical land marks, world class dining, wine tasting, spa treatments. 45-60 min from San Francisco, Sacramento and the beautiful Sonoma Coast. We really enjoyed our stay at Mary Jean’s Place. It was perfect for two couples - squeaky clean, spacious, perfectly appointed, and well located. We recommend it! What a great place to crash in wine country! The property was in fantastic shape and in a great spot just outside downtown Sonoma square. We were able to park our truck in front the entire weekend! Terry was incredibly accommodating and truly made the trip for us. This place was perfect for us. A very short walk from Sonoma Square great for a short bike ride or a 15min walk. The house was great! Very tastefully decorated and well stocked, much more than what we expected. Terry was fantastic and gave us a personalized tour when we arrived. I would absolutely recommend this place and I would stay again. Just what we needed! Thank you so much for great communication and all the help along the way! We will be back! Perfect location, just a short walk to Town Square, far enough from any hassle, great place. Wonderful large and private apartment, very quiet all the time, with everything one needs. Very new high end bathrooms, open living room and very comfortable furnishings. Fresh crisp linens, lots of towels, toss blankets in the living room, killer AC if needed. Terry is very responsive if needed, but as the same as last year he is never noticeable or invasive, we met with him once when we checked in and that was it, but he is on his mobile in a minute if needed. It really seems like it is just your own place with everything set up as you would have it. Always good parking, even for our big race rig. Both keyed and keyless access which is convenient. Very safe and well lite area/access on Broadway. Back again next year for sure. Due to the many requests we receive for lodging that is pet free, from hyper-allergenic tenants, any persons traveling with service animals will need to give notice at time of booking, provide documentation and pay a cleaning fee of $650.00 to restore home to pre-rental condition.